In any attempt at deciphering primate origins within archontans, we should never forget the significance of: (1) the divergence of skull form in paro-momyids, plesiadapids (?carpolestids) and (2) a divergent, cross specialized, and continuous record of dentitions, which further eliminates plesiadapiforms from any ancestral role in primate origins. The primatomorph hypothesis is dentally impossible, and cranially very unlikely. The carpolestid hypothesis (Bloch and Boyer, 2002) is as dentally impossible as the primatomorph hypothesis, strongly suggesting that carpolestid hallucial grasping with a nail must be convergent with primates (the tarsals and skull should confirm, or refute, this). Even if Plesiadapis turns out to have a real petrosal bulla, its skull and dentition would strongly suggest convergence. In fact, any sister-group relationship of one plesiadapoid family with primates which would be nested within other plesiadapoid families is dentally impossible (as it would imply that all the dental characters supporting the notion of plesiadapoids are convergent, destroying the systematic validity of this group). Despite the attractiveness of cladograms, numbers, and computers, a partial data set, or a very large one, will never render likely a hypothesis that one well-known anatomical system renders impossible. For this reason, the dental record of plesi-adapiforms, which excludes any ancestral relationship to primates within them, should not be ignored (Figure 7). Whereas a very ancient common ancestor with primates is possible, a nesting of primates within the plesi-adapiform radiation cannot be taken seriously. If the hypothesis of a close tupaiid-primate relationship is valid, it should be corroborated in the future via the study of dental characters. Dental characters have proven to be of little use until now because there is no Paleocene record of a tree shrew. An Eocene species from China shows two primitive tupaiine dental characters (Tong, 1988). Ptilocercus is dentally more primitive than other tupaiids; however, it certainly has a number of derived ptilocercine characters that render the reconstruction of the ancestral dentition of Tupaiidae difficult (Butler, 1980), in turn hindering a complete evaluation of the tupaiid-primate hypothesis. At this moment, the primate dental morphotype is also very difficult to reconstruct: Altiatlasius is of critical importance, yet a confirmation of its primate status would be welcome (Godinot, 1994; Sige et al., 1990; Silcox, 2001). The meaning of the dental characters of Altanius is still ambiguous. As seen in an earlier section, the eosimiids also introduce new characters in the primitive primate morphotype (e.g., trigonids not decreasing in anteroposterior breadth from M/1 to M/3, absence of well-developed third lobe on M/3). For dental traits too, the removal of ple-siadapiforms from the primates considerably modifies some of the ideas we might hold about primitive primate dental characters and their polarities. For example, relatively large conules on the upper molars could be presumed to be primitive based on their presence in several early plesiadapiforms. Discarding the last group, directly comparing Early Eocene Primates with Ptilocercus or Purgatorius, it appears that the earliest primates may have possessed only very small conules (which would better fit with the later enlargement of conules in some groups of primates, e.g., microchoerids and parapithecids). Similar changes in our interpretation of the polarity of other dental traits might occur. The primitive primate dental morphotype is at present in a state of great uncertainty. In this context, a better understanding of the polarity of dental traits in plesiadapiforms, already well advanced by Silcox (2001), is still critical. It should help us understand polarities in early "primatelike" dentitions. It was argued in the introduction that, confronted with very large and contradictory data sets, the best strategy is to progressively delineate those data that are likely to be misleading, and to eliminate them, or consider only their possibly informative part. Our knowledge of postcranial characters in plesiadapiform families and in other early archontans is still not complete enough to extract secure phylogenetic signals. 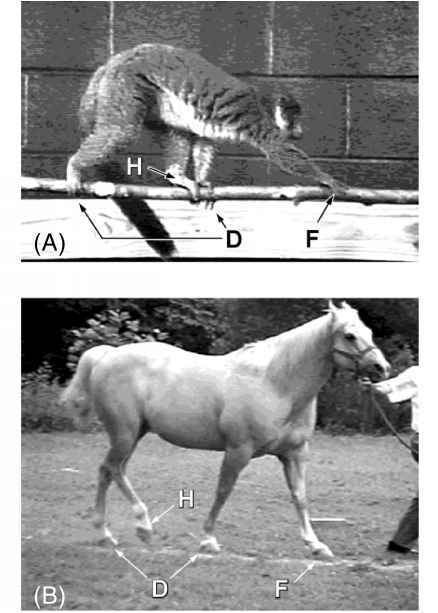 This means that the forelimb axial skeleton and the hindlimb data sets in Simmons (1993), largely generated from Beard (1993a,b), should be completely reassessed (in agreement with Szalay and Lucas, 1993, 1996; Sargis, 2002). The tarsal evidence appears more convincing; however, it needs to be tested through the detailed study of Carpolestes tarsals. Despite the carpal autapomorphies found in the living Ptilocercus (Stafford and Thorington, 1998), further work on the carpals should also provide phylogenetic signal. Many of the changes in cranial and dental character interpretations mentioned above resulted from the study of new fossils (e.g., the beautiful skulls of paromomyids and the dental remains of eosimiids). This shows one more time the critical importance of historical information to reach better phyloge-netical hypotheses (e.g., Gauthier et al., 1988; Donoghue et al., 1989). Soft anatomical characters are less useful for the deciphering of ancient branching events because we usually do not have enough information on their patterns of evolution (frequency of convergences, reversals, factors involved, etc.). We must try to integrate lessons from the fossil record when searching for those few characters that provide the best phylogenetic signal. We should also examine the adaptive significance of those characters and carefully scrutinize alternative scenarios of their morphofunctional transformation. Such a strategy differs from conducting a parsimony analysis of as many characters as possible. Other anatomical evidence and molecular studies will help confirm or contradict the tupaiid hypothesis; however, ultimately, a denser record of dental and tarsal characters will lead to a richer documentation of the scenario, or to its refutation.